“Cottages at Maplewood [Waseca, Minnesota],” ca. 1880-1899. By Detroit Publishing Co., via Library of Congress Prints and Photographs Division. 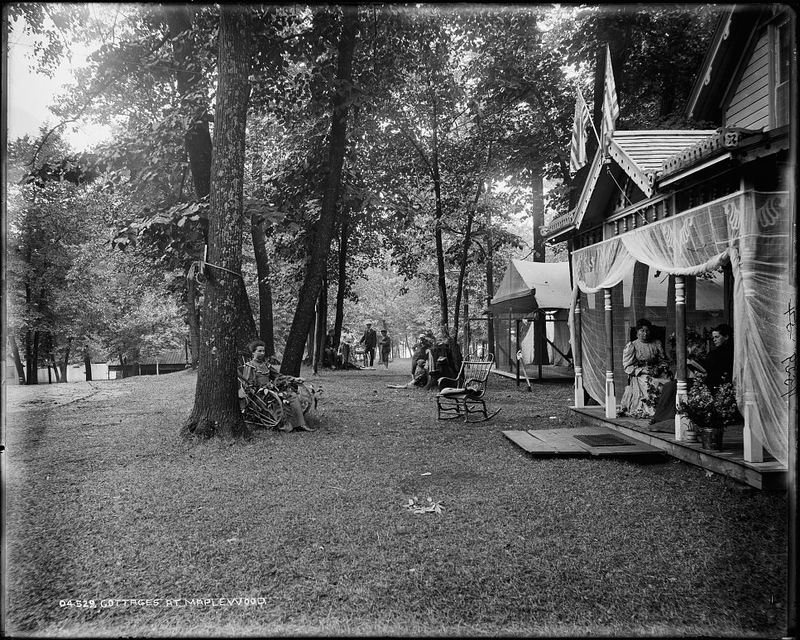 Maplewood Park on Clear Lake was a national vacation attraction at the end of the nineteenth century. Click the image to enlarge it. For another sort of summer cabin living, see today’s New York Times, here. Absolutely charming! Wish I could just step back there for a few days…thanks for sharing! Such stillness. I feel pulled into it. I would love to be sitting with them on that draped front porch — with some iced tea. I love vintage photography and this images definitely evokes an era. Will slowly reading your blog to catch up. Imagine covering that porch in netting! Hope they were able to do it on a cool day before the bugs arrived. That had to be a big job! What a beautiful effect though! When we go back to Washington, I’m going to paint our little porch’s ceiling blue and hang muslin curtains — eventually.